Character Recognition and Naming. From Unit to Gestalt: Perceptual Dynamics in Recognizing Chinese Characters (Jong-Tsun Huang, Man-Ying Wang). Graphemic, Phonological, and Semantic Activation Processes during the Recognition of Chinese Characters (Giovanni B. Flores d'Arcais). Lexical Access in Chinese: Evidence from Automatic Activation of Phonological Information (Chao-Ming Cheng). Recognition Processes in Character Naming (Chih-Wei Hue). Lexical Structure and Word Processing. Psychological Reality of the Word in Chinese (Rumjahn Hoosain). Decomposed Storage in the Chinese Lexicon (Biyin Zhang, Danling Peng). Judging Homophony in Chinese: The Influence of Tones (Marcus Taft, Hsuan-Chih Chen). Sentence and Text Comprehension. Reading Comprehension in Chinese: Implications from Character Reading Times (Hsuan-Chih Chen). 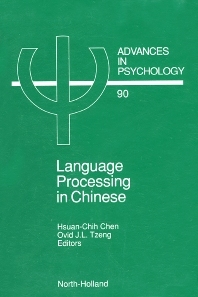 Cues as Functional Constraints on Sentence Processing in Chinese (Ping Li, Elizabeth Bates, Hua Liu, Brian MacWhinney). Language Acquisition. Language Development in Chinese Children (Xiaochun Miao, Manshu Zhu). The Acquisition of Chinese Syntax (Hsing-Wu Chang). Theoretical Implications of the Principles and Parameters Model for Language Acquisition in Chinese (Yu-Chin Chien). Neuropsychological and Methodological Issues. Deep and Surface Dyslexia in Chinese (Wengang Yin, Brian Butterworth). Cross-Linguistic Research on Language and Cognition: Methodological Challenges (Terry Kit-fong Au). The aim of this book is to integrate the most recent research in the cognitive aspects of the Chinese language into a single academic reference for those interested in language processing and related fields. Chinese is perhaps the most widely used language in the world. In addition to its popularity, many specific features make it unique in relation to many Indo-European languages. Chinese words generally do not have inflections indicating grammatical attributes such as number, gender and case for nouns, or tense and aspect for verbs. Chinese words have no inherently marked lexical categories. Unlike the alphabetic symbols common to Indo-European languages, the Chinese writing system is logographic in nature. Chinese script/speech relationship is highly opaque, with the Chinese characters representing lexical morphemes in contrast to alphabetic symbols which represent phonemes. This volume presents research findings indispensable to the general understanding of human language processing about how people process the Chinese language.